Though snacking before bedtime is generally frowned upon, you can try eating a spoonful of raw, organic honey or two tablespoons of raw almond butter with a celery stick before hitting the sack. You could also try small portions of tryptophan-containing foods, like chocolate and oatmeal (see 20 Snacks That Just Might Make You Sleepy). Not hungry? Breathe in and out through your left nostril or mentally trick yourself into thinking that you're going to stay awake for as long as possible. Got your own weird tricks for falling asleep? Share with us! For other sleep-related posts, check out some of my past illustrations below. Yumi Sakugawa, I found your post very interesting. 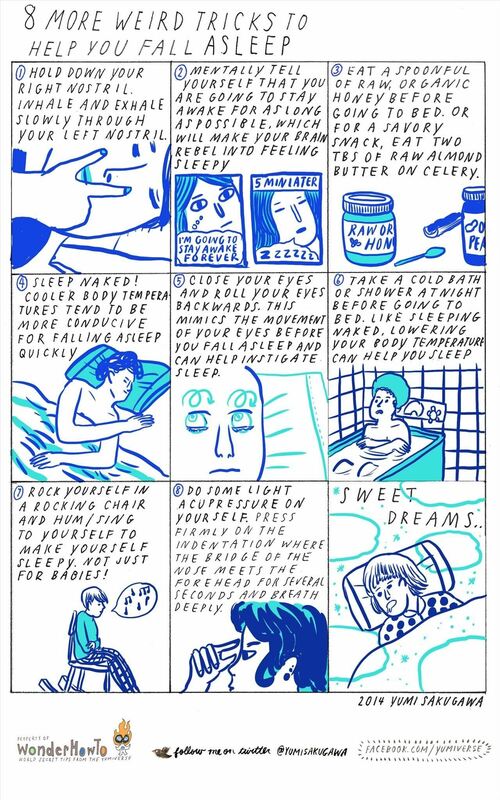 I have a lot trouble sleeping and have actually tried some of these. The tricks that I used worked fairly well for a while until I got used the process. I will be sure to try the other tricks that I haven't tried before. Thank you for the post. Anyways, good job and hopefully these tips will help. Thanks so much for reading! Let me know which tips work best for you, I am curious.